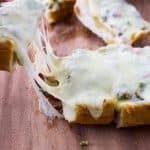 Cheesy Olive Salad Bread for a Crusty French Bread Appetizer!Cheesy Olive Salad Bread for a Crusty French Bread Appetizer! Toasty French Bread is topped with my New Orleans Olive Salad and covered with cheese. Broiled until melty, this cheesy olive salad bread is sure to be a hit! Slice bread loaf in half lengthwise. Place on a foil-lined baking sheet, cut side up, and toast for 3 minutes to get a slight toast on the bread. Top with cheese to cover the olive salad. Place back in the oven and toast for another 5 minutes or until the cheese is melted and starts to brown. I don’t let mine completely brown as the cheese doesn’t pull as well but toast it to your liking. If you want the cheese to pull you need to add the olive salad to the bread and then slice your bread. Add the slices to the pan and push them together to form the loaf again. Then add the cheese and bake. This makes serving easier too! Plus you get that gorgeous cheese stretch!